Back in the early spring, the kids and I planted a few pots of vegetables. We planted lettuce, peas, and carrots. The peas and lettuce have long since been harvested but the carrots hung around in their pot for quite a long time! I finally just pulled them out last week so I could use the container for something else. Olivia was the carrot planter and she planted them very densely! We sort of thinned them out but for the most part just left them alone for several months. I have to say that planting carrots in containers makes a lot of sense to me. The carrots can grow long and thin, which I find to be a more tender crop. Often when I plant carrots in the ground or in a raised bed, they grow into rocks or each other and I end up with some pretty quirky looking carrots. My only mistake this time around was not pulling them back in late July/August so I could plant a fall and winter crop. Oh well… I know what I will be doing next year! What you don’t have to wait to plant until next year is lettuce, spinach, and other greens. My friend, Katie, just asked me the other day if it would be silly to plant a pot of lettuce. I said, “heck no!” The general rule of thumb is anything that you plant in early spring, will do well if planted in the late summer/early fall. Lettuce and peas like cool weather so it’s a good time to plant these crops. There is the possibility of an early frost; in which case, just move your pot closer to the house for protection or cover with some floating row cover or even a light fleece blanket. I planted a pot of winter lettuces and also a pot of kale. At the community garden, the elementary school kids planted lettuce, spinach, peas, and as an experiment- leeks. We are curious to see if the leeks will overwinter and come up in the spring. I love experiments and seeds are relatively inexpensive. How about you? Are you experimenting with any fall and winter gardening? Portable Garden Gets New Home! This is a good reminder. I should get a new round of seeds in the ground for greens! And I need to pick my kale so it will keep growing. 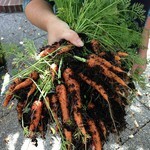 Love your carrots and that your kids are so involved in gardening. I can’t wait to make Graham his very own garden box like you did for Gavin in NY.